In Sartirana the ancient rice mill becomes an unusual and evocative venue. La PILA is an eighteenth century warehouse and mill, where the rice was stocked and refined. La Pila is a unique building that was wonderfully preserved during the centuries. Its name derived from the process of “pilatura”, that is a part of the refining process of the rice, where the husk – “pula” in Italian – is separated from the rice grain. In la Pila the rough rice was transformed into white rice, ready to be consumed. La Pila was originally part of the Sartirana Visconti castle estate (14th century) and it is located in Lomellina, a geographical and historical region located in the South – West Lombardy. Lomellina is mainly known for being a rural region and it is famous for its rice paddings, which define its landscapes, and its medieval villages and monuments. Throughout the centuries La Pila has kept its original architectural features. In its spaces it is possible to recognize the peculiar wide wooden trusses and the Lombard cotto tiles of the floor. In Museo Contadino are perfectly preserved evidences of the rural and industrial archeology: wooden equipments, hoppers, the stocking lines and the rare mill with horizontal wheel. Today La Pila promotes and organises cultural and artistic activities. In our halls it is possible to admire the amazing creations of Ken Scott – famous stylist of the ’60ies and ’70ies, icon of Pop culture. 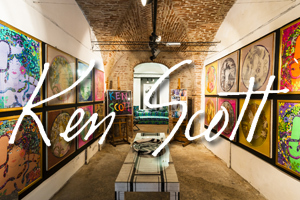 Two beautiful Ken Scott collections garnish La Pila: Ken Scott Food Mood – a funny collection entirely dedicated to food and the Foulard Collection – over a hundred pieces that enrich la Pila halls.